Unpunched paper for printers, copiers or craft. Great for sketching and drawing. Custom paper pulp blend with superior performance compared to traditional 80 g/m² printer paper. 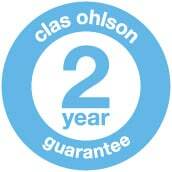 Clas Ohlson's own value-for-money A4 copy paper. Made of a 75 g/m² custom paper pulp blend which gives our paper superior performance when compared to traditional 80 g/m² printer paper. Works equally well in both printers and copiers. Also great as loose drawing/sketching sheets for children. Ecolabelled, un-punched sheets. Each individual pack comes with 500 sheets. Also comes in a 5-pack carton. EU Ecolabel, the ecolabel which certifies that the product has a reduced environmental impact. special paper pulp blend which gives superior performance when compared to traditional 80 g/m² printer paper.